Enjoy the beautiful views of Saguaro Lake on a 90-minute live music cruise. Set sail on the Desert Belle, a historic ship while listening to live music from local artists and musicians. You'll get a chance to see the iconic mountains of the Tonto National Forest and watch an incredible sunset. 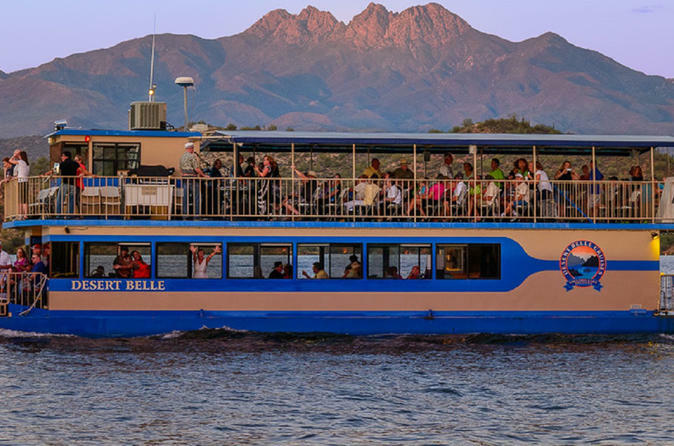 Prepare to see some of Arizona’s most iconic plants and wildlife from the comfort of the Desert Belle, a restored 1964 cruise ship. Board the vessel at the Saguaro Lake Marina and stake out a prime viewing spot inside the air-conditioned cabin or beneath the upper deck’s shaded canopy for this 90-minute ride. Be sure you have your camera ready when the ship pulls away from the harbor, and snap away at the first awe-inspiring view of the rust-colored mountains. Beautiful Saguaro Lake is nestled in Arizona’s Tonto National Forest, 20 miles (32 km) outside of Mesa. Named after the saguaro cacti that surround the lake, it has 22 miles (35 km) of picturesque shoreline, expansive views and indigenous flora and fauna. Enjoy the sights of Arizona’s dramatic desert and soaring canyons formed by millions of years of geological forces. Spot cacti, mesquite and prickly pear plants sprinkled throughout the landscape. Looks for coyotes, bobcats and bighorn sheep lurking in the hills. Sit back and enjoy live music played on board by local Arizonan bands. Music genres include Alternative, Jazz, Blues, Classic, Acoustic, Band Tributes, and many others. Purchase beverages such as beer, wine and soft drinks from the concession stand on board the Desert Belle and then sit back and enjoy the ride. An optional upgrade is available for priority seating, which includes one drink and popcorn.